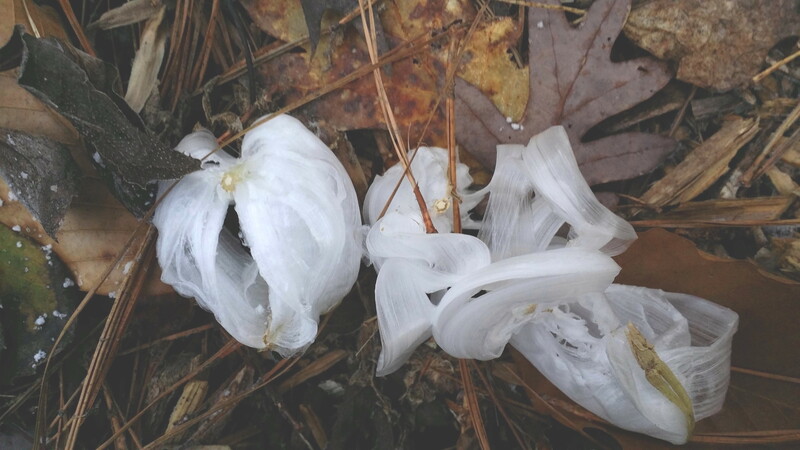 Frostweed – Verbesina virginica – is one of the very few plant species that can form unique and beautiful ice sculptures when winter conditions are favorable. 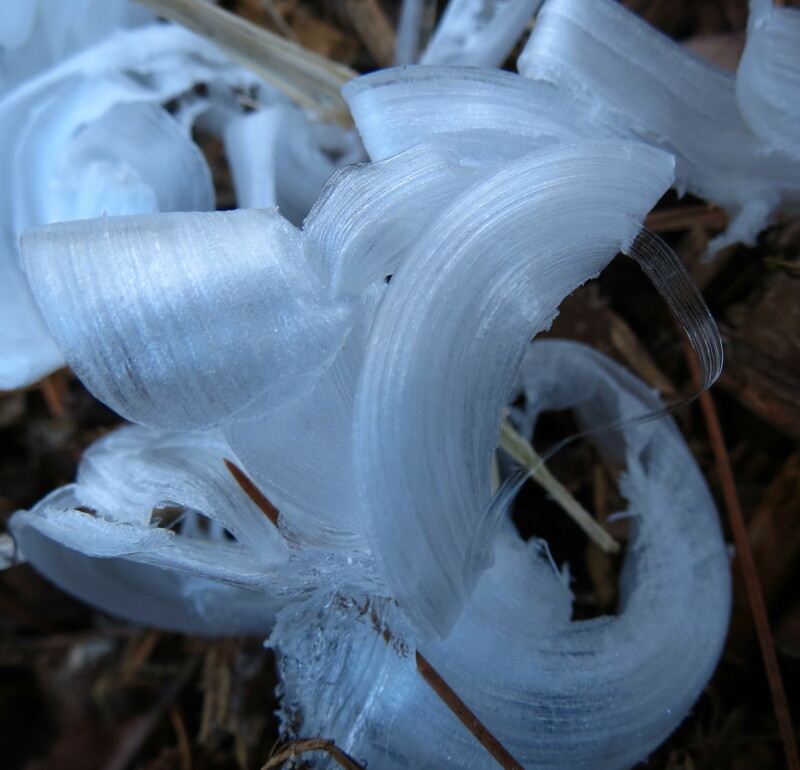 The weather in Central North Carolina this January produced perfect conditions for the creation of these ice formations, which are sometimes called “crystallofolia”. The ground was saturated with moisture from frequent rains, and retained warmth from far above average temperatures in December. Hard overnight freezes in January created a layer of below- freezing temperatures at the surface of the soil, while just below the soil surface, the temperatures remained above freezing. Moisture then began to freeze in the plant’s stem, and the subsequent ice was extruded from the stem. Moisture from the roots was drawn into the stem to continue the ice formation. Below are ribbons of ice from two different plants. Both of the plants pictured above were small, first year plants, and only one bloomed this past summer. Knowing the root system had to be limited, how did this much ice come from such a small plant? One answer is that the ice ribbons are very thin, fragile, and insubstantial. They crumble into pieces when touched and melt easily when the temperatures rise. There really isn’t as much fluid there as it appears. In addition, the soil saturation may enable the roots to continue to withdraw moisture from the soil during the process. Another interesting phenomenon is that ice sculptures can be produced a number of different times. These plants have produced five consecutive frozen ice sculptures as of this writing. The sculpture melts as the weather warms, and several days later, a new hard freeze triggers the extrusion of another complete ice formation. Each new sculpture is virtually identical to the previous one. A closer look at an ice ribbon reveals a series of grooves or furrows in the surface of the ice. It has been speculated that these grooves represent the vascular structures of the stem. While this may be true, it is interesting to note that inanimate objects are also capable of producing similar ice structures. Areas of soil or clay can produce needle ice, as can pieces of dead wood and mulches. Various parts of hollow metal fences can also produce ice ribbons similar to those pictured above, including the grooves along the surface. Several other plants species are known to be capable of producing ice sculptures, especially Cunila origanoides (Common Dittany), and several species of Pluchea (Camphorweeds). 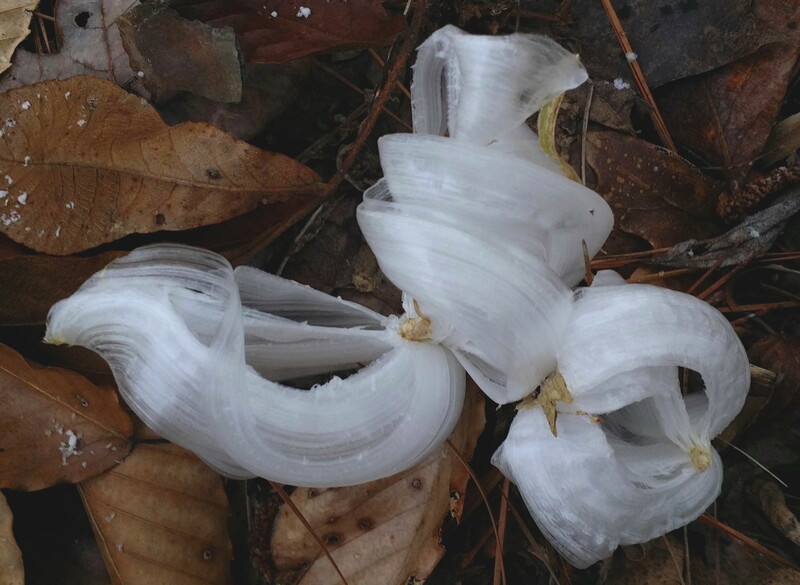 However, the closest relatives to Frostweed do not produce ice sculptures: Verbesina occidentalis (Crownbeard) and Verbesina alternifolia (Wingstem), both extremely common in Central North Carolina. 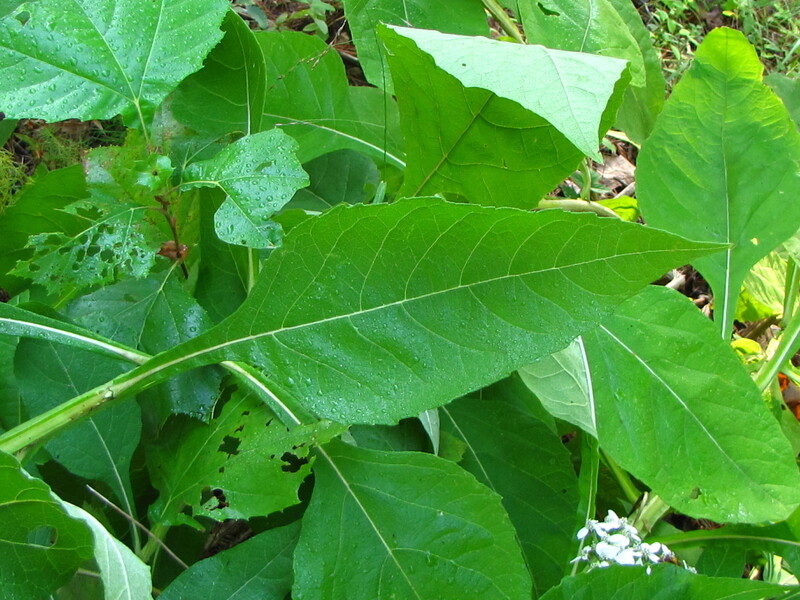 The plant form of Wingstem in particular is very difficult to distinguish from Frostweed, both having similar alternate leaves and winged stems. Evidently the structural factors required for formation of ice sculptures are highly specific and rare. 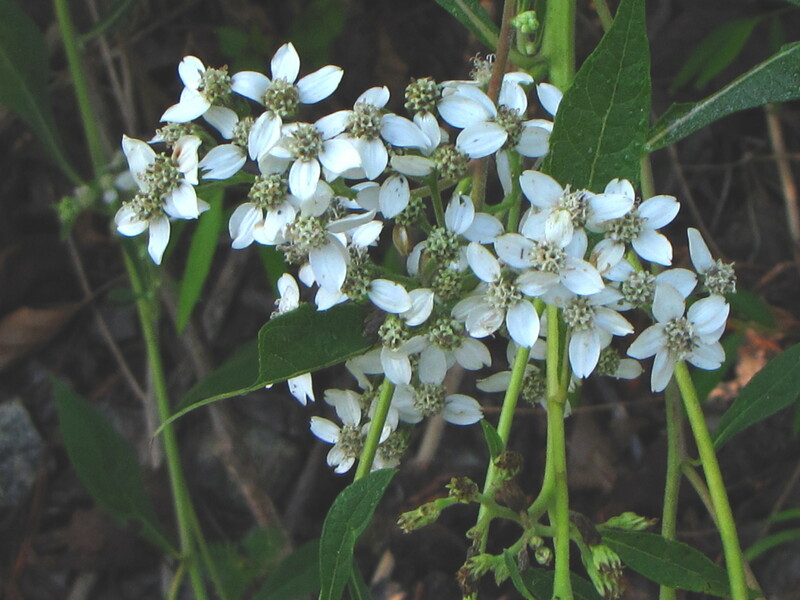 Frostweed leaves are pictured below. This entry was posted in Uncategorized and tagged Camphorweed, Common Dittany, Crownbeard, crystallofolia, Cunila origanoides, Frostweed, ice ribbons, Ice Sculptures, Pluchea sp., Verbesina alternifolia, Verbesina occidentalis, Verbesina virginica, Wingstem. Bookmark the permalink. Herb, this is absolutely fascinating! Thanks.